The holiday season is a time to be with family and friends. Both my husband and my family love to get together during the entire holiday season. We'll plan a night to decorate Christmas cookies and another night to make gingerbread houses. But sometimes, we don't make any plans and all of a sudden I'm told we are hosting a get together with friends the next day and I am unprepared. So this year, I wanted to share with you some of the tips and tricks I use for planning a last minute holiday party. These are all things I've learned over the years that work great and make a quick gathering just a bit more special for everyone involved, including me!! I hope you'll find them useful for planning your last minute party. I've also enjoyed looking for inspiration for parties ahead of time like this inspiration page put together by Coca-Cola®. 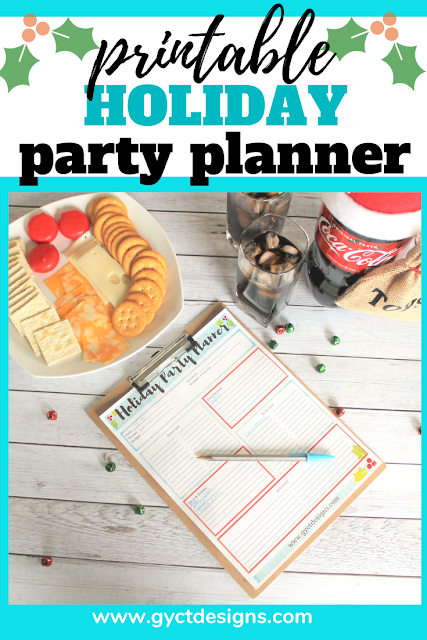 The best way to plan a last minute party or gathering is using a simple printable party planner like this one. Just print and fill it out with who, what, where and how. 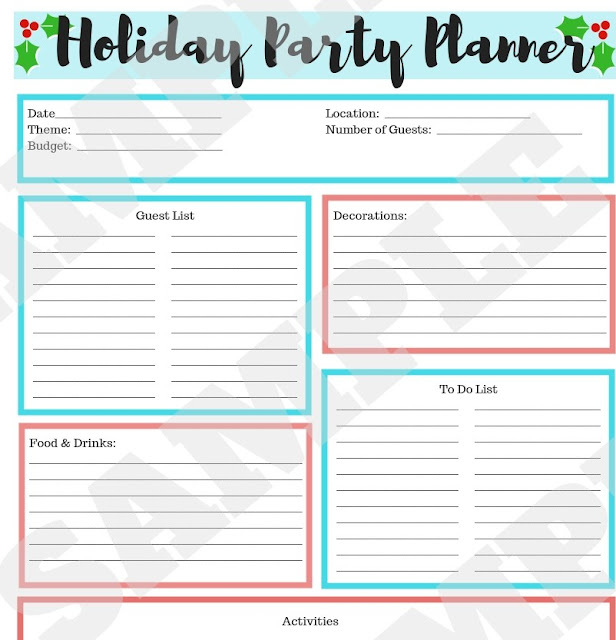 A printable party planner will ensure that everything on your list gets checked off and that nothing (and no one) gets forgotten. Just print a couple copies and have them handy for those last minute parties. Plus, since this is a free party planner, you can just click, submit your email and print!! It is easy as that. It will be delivered right to your inbox and you'll be able to get planning NOW!! Don't go overboard. It will make you crazy and stressed. Instead, keep it simple. I usually start by grabbing my shopping list and heading to my local Walmart. Since I can get decorations and food at the same time for a great price, I usually start there. Grab some cheeses and crackers from your local Walmart store and make a platter for snacking. Or perhaps you might want an already prepared vegetable tray. This makes a simple appetizer without all the hassel. 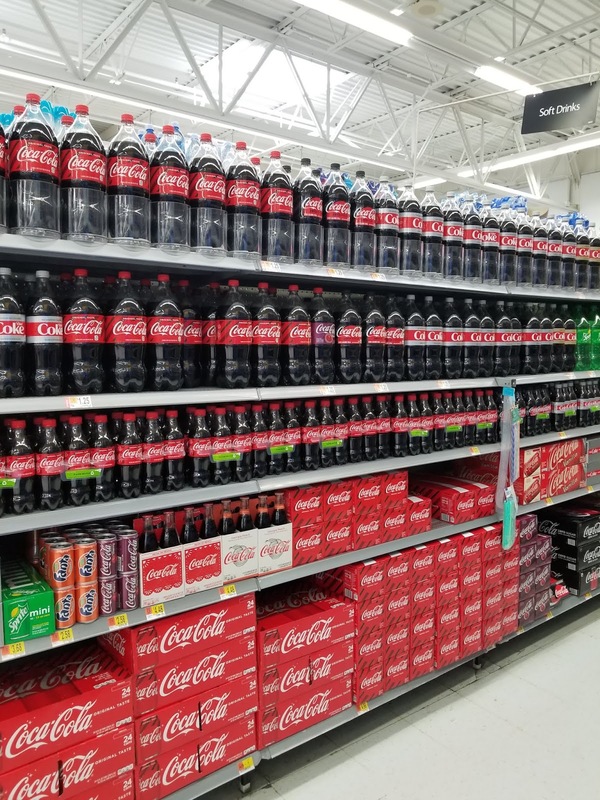 And you can keep everyone at the party happy as long as you don't forget to pick up everyone's favorite drink, Coca-Cola® and some ice for the perfect party drink. Coca-Cola® makes for an easy party drink but if you feel like you want to dress things up a bit? How about trying this super simple Coca-Cola­® drink recipe that all your guests will really enjoy. Quick Tip: Vanilla is not easy to just get a couple drops. So put some in a measuring spoon and use that to help you add the vanilla to each drink. Doesn't that sound so yummy. Plus, it is super quick and doesn't take a lot of preparation. 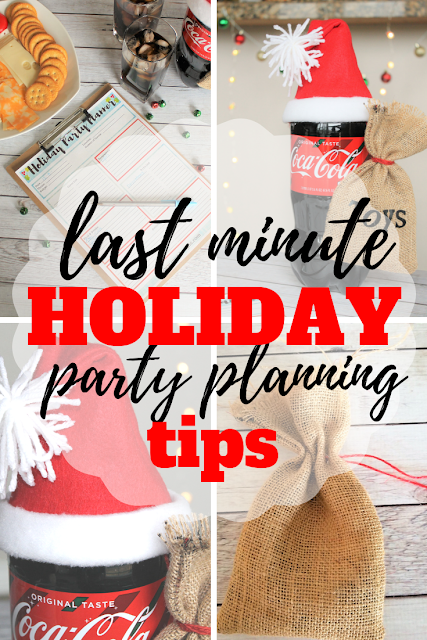 Just add Simply® Cranberry Cocktail to your Party Planner Printable shopping list and you are set to go! 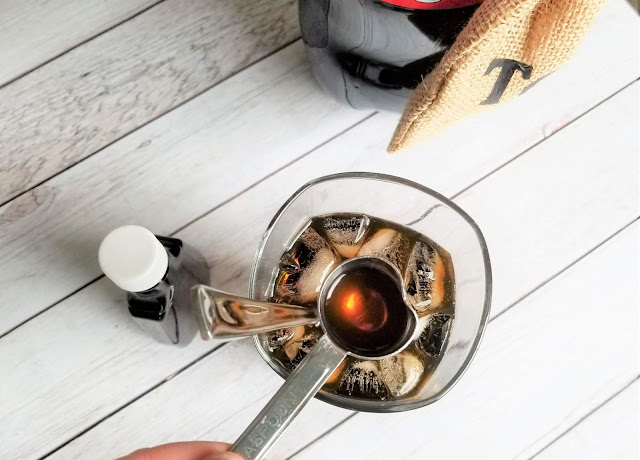 You can serve Coca-Cola® as the classic drink or as a fun Coke-tail depending on your guests tastes. Don't worry about spending more time and money on decorating. Use what you already have to decorate. Hang up some unused Christmas lights on the wall behind your snack table. Add some jingle bells from the kids craft closet to the tablescape. Or use some decorations from another part of the house to hold your food like put popcorn in this cute Santa Bucket or hang up winter mitten garland across the front of your table. Find decorations you already have to spruce up your table. Even better. Why not make some of your purchased food and drink items as the jumping off point in decorating. Use that vegetable tray to make a Christmas tree with celery, broccoli and tomatoes. 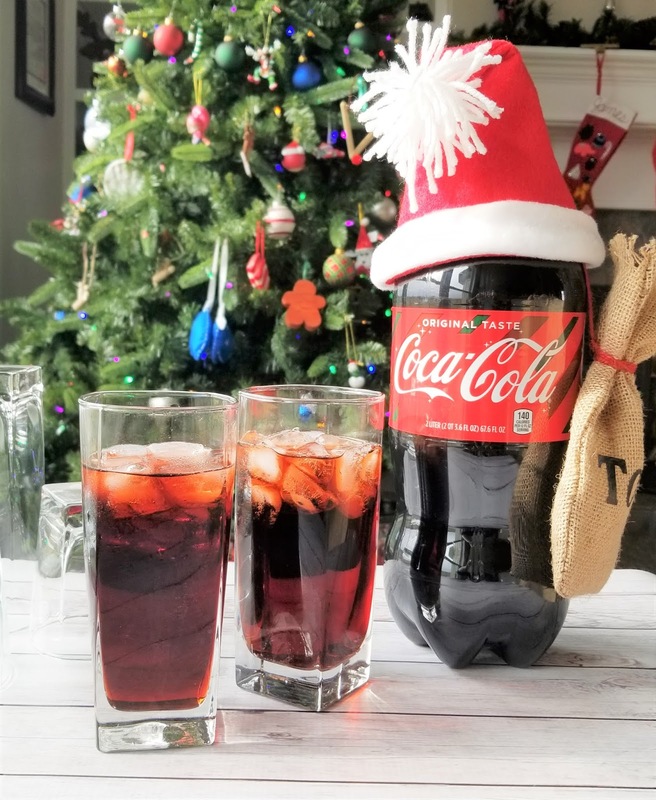 OR better yet, why not turn that Coca-Cola­® 2-liter bottles into a centerpiece for your table by turning it into a quick Santa decoration. Begin by tracing out 2 triangles that are 7.5" wide and 8" tall (#1). 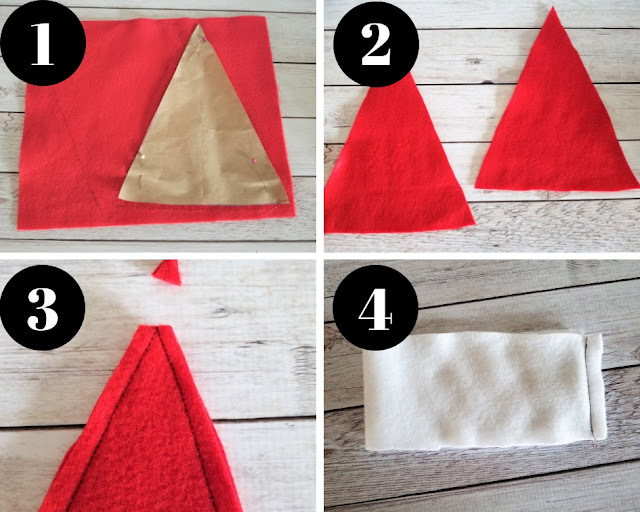 Cut out 2 triangles in red felt and one long piece in white fleece that measures 14" x 3" (#2). With right sides together, stitch the 2 triangles together down the 2 straight sides. Trim the top of the triangle off (#3). With right sides together, fold the white trim in half matching the short sides. Stitch together (#4). Fold the white trim in half so it is one large circle. Place the right side of the white trim around the bottom edge of the wrong side of the hat (#5), stitch. Turn the hat right side out and fold the white trim up. Wrap white yarn around your fingers about 20 times (#6). Tie a piece of yarn around the middle of the wrapped yarns and tie it in a square knot, tightly (#7). 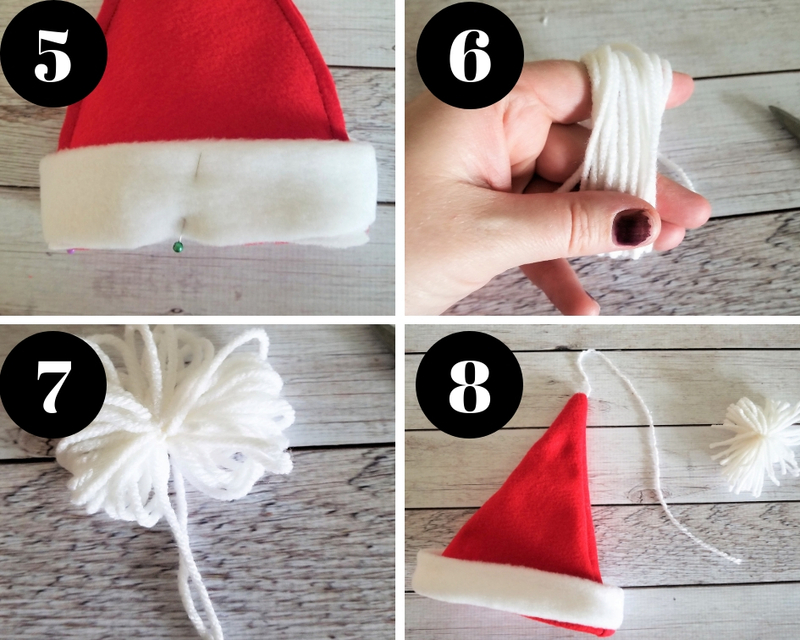 Thread the long yarn through the top of the Santa hat and tie in place (#8). Now you should have a pom pom on the top of your hat. 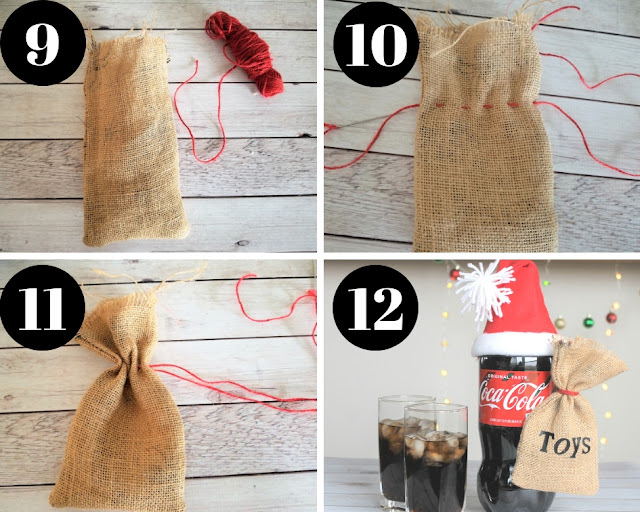 For the Santa Toy Bag, take some burlap and stitch up 3 sides to make a sack (#9). Turn it right side out (#9). Thread red burlap yarn across the top of the sack and back again (#10). Pull the yarn tightly and tie a knot (#11). Tie a knot on the end and hang it over the neck of a 2-liter bottle of Coca-Cola. Add the Santa hat on top (#12). 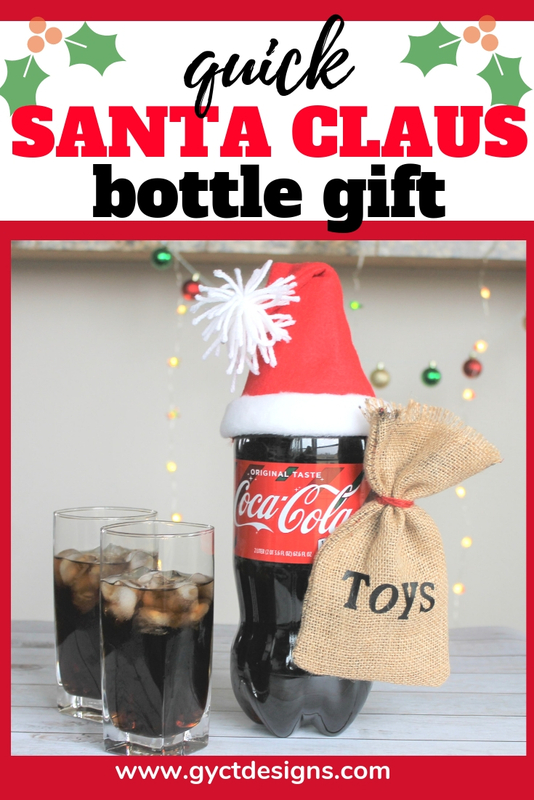 See how quick and easy it is to make Santa Claus with a bottle of Coca-Cola®. Wouldn't this make the perfect gift for your party guests as well!! Make one for each family and send them home with a surprise in their toy bag and the recipe for the Cranberry Vanilla Coke-tail Recipe so they can make them at home too! It's the perfect holiday gift for all those friends and family on your list. You could also make an adult or child size Santa Hat to gift along with your Coca-Cola® bottle using our free Santa Hat sewing pattern. Head over to the Coca-Cola website for loads more great holiday inspiration and ideas. It is the season of giving and sharing, why not invite your guests to participate in the party planning by bring a snack or dish to share. Or better yet, have your guests bring a game or activity for the party. You as the host or hostess can focus on getting all your favorite snacks and drinks and don't have to worry about what games or activities to prepare. If that isn't an option, do a simple white elephant gift exchange. Invite each guest to bring an item from their home they aren't using to exchange. This way your are all sharing something you have loved and enjoyed but gifting it to a friend now. White elephant gift exchanges are great for saving money and time for the host and hostess and the guests as well. And if anyone forgets a gift, you can use some of your Coca-Cola® Santa Claus bottles as gifts in the exchange. Holiday parties should not be stressful. Even last minute parties. Remember that the holidays are a time for friends and family to get together and enjoy one another. To share traditions, memories and make new ones. 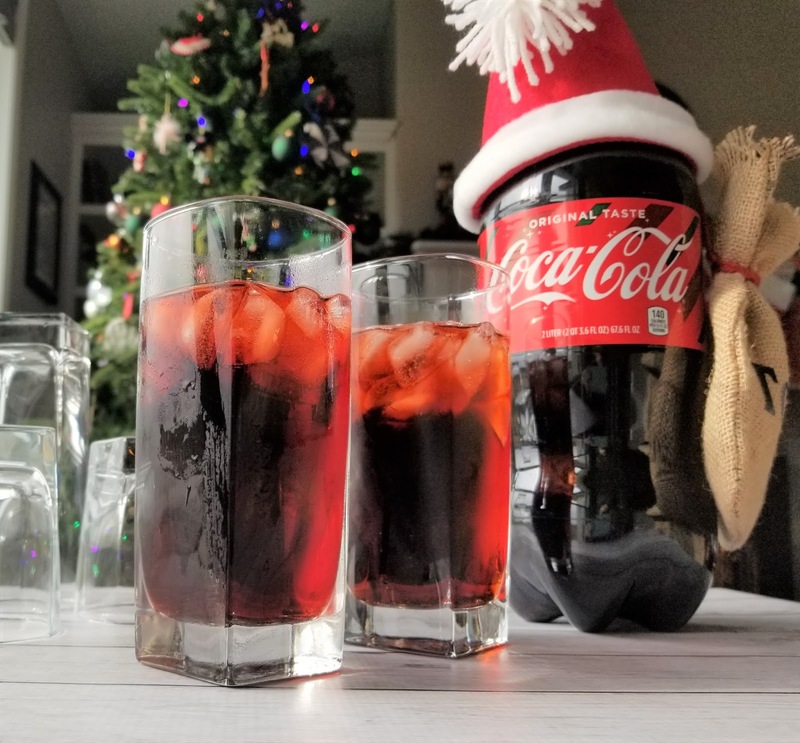 Instead of stressing over the perfect party, check out some ideas for party inspiration, fill out that party planning sheet, grab everything you need from Walmart and sit back, relax and enjoy a nice cold Coca-Cola® with the ones you love!